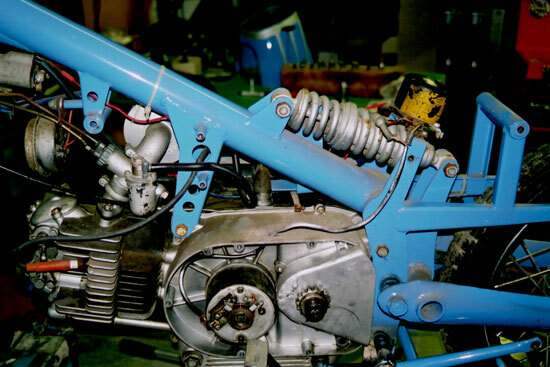 1957 Chimera Vintage Motorcycle - Paul BrodieFlashback Fabrications Ltd. The Chimera is the work of Ing. 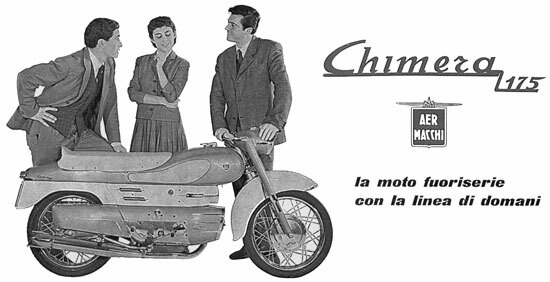 Alfredo Bianchi, the new technical director hired by Aermacchi in early 1956. He had previously worked at Parilla and the Alfa Romeo car company. 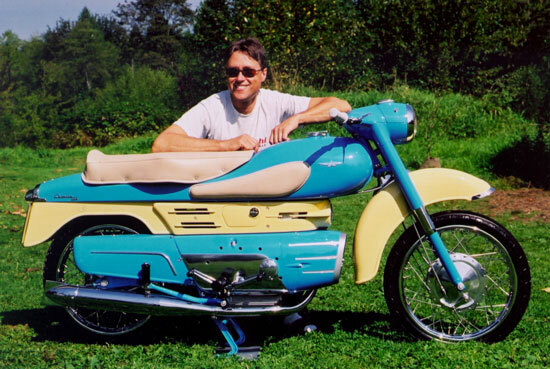 Launched at the November Milan show that same year, the futuristic Chimera was based on a sketch of the “ideal motocycle” drawn up by Count Mario Revelli, a well known car stylist. 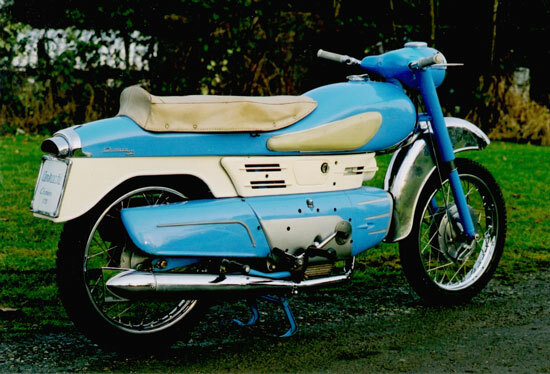 It was the star of the show, but proved to be a costly sales flop from 1956 to 1964, the last year it was made. Only 119 175s and 177 250s were ever produced. The bodywork was a combination of light alloy die castings and steel pressings. The tank/seat unit is one piece, secured only by two bolts, and is easily removable. 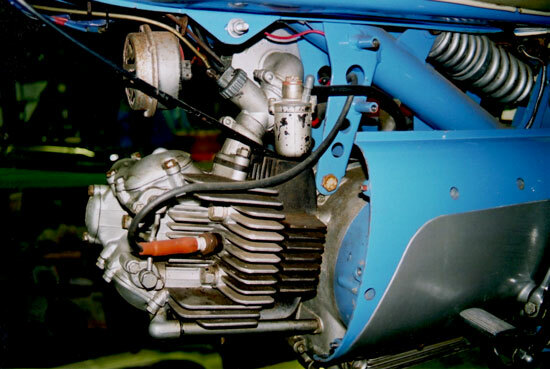 The Chimera was initially offered in one engine size of 172.4cc (60 x 61mm), had a compression ratio of 7:1, and a corresponding 13HP! 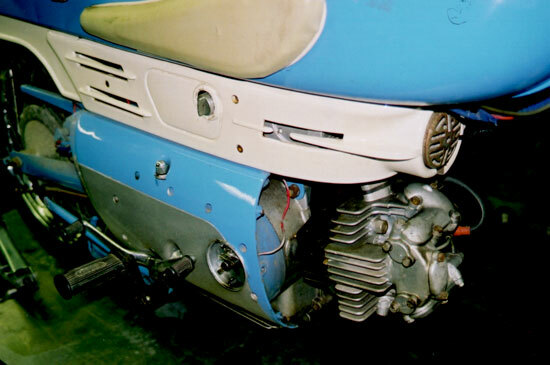 A magazine road test at that time found the top speed to be slightly better than 65mph; good for the mid 1950s. My Chimera was purchased from a friend who owned it for a couple of years. It was previously in the Canadian Museum of Flight and Transportation in Langley, BC. Nestled between airplanes, it had languished there for years – under cover but unheated. The moisture had not been kind to some of the chrome. 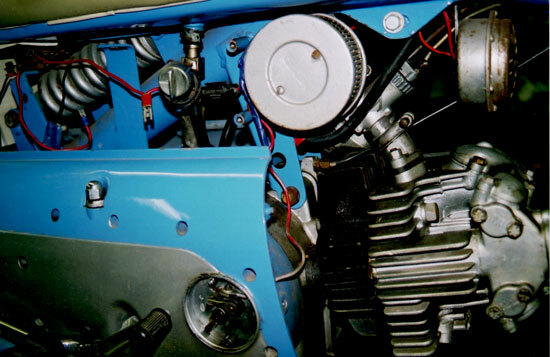 The picture below is after I bought it, unrestored, but polished up. The following (4) pictures are after I bought it, unrestored, but polished up. The restoration was completed, and the Chimera was on display in the Guggenheim Museum in Las Vegas, NV. It was sold after it left the Guggenheim Exhibition on December 31, 2002.